With close to half a million downloads and counting, we have been enjoying the widespread success that our Zoho Mail mobile app has found. In wanting to extend this success as well as keep pace with rapid tech advancements, we are excited to unveil our new and updated Zoho Mail mobile app for iOS and Android. From a complete Material Design UI makeover for Android, to support for 3D touch, Apple Pencil, and dedicated Apple Watch App for iOS, we have striven to cover all bases. When we released the first version of the Zoho Mail app, we were inspired by the high influx of feedback we received. Let’s take a look at what exciting new features we have in store for you. Multiple account support – These days many of us have multiple email accounts. One for work, and one for your blog. With this update, managing all your mail for all your Zoho accounts becomes easier, thanks to one unified inbox. Conversation view – One of the favourite features of our customers about Zoho Mail on the web is conversation view. 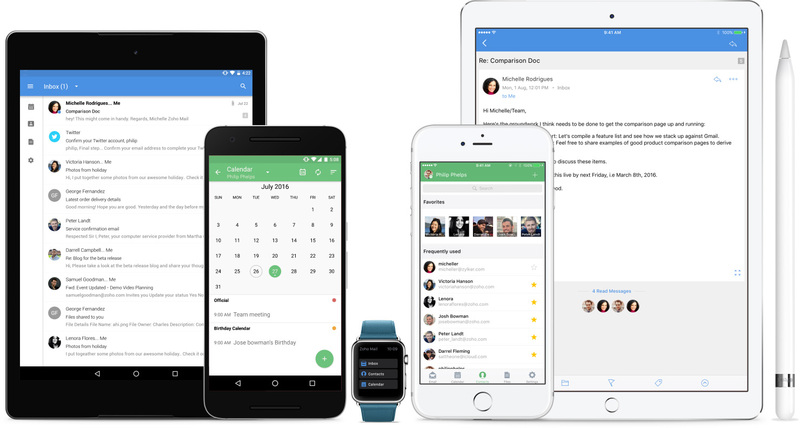 Conversation view keeps your inbox tidy by bunching together emails of the same thread. This way your emails are organized and give you all the context you need to reply to those long email threads. Improved Contacts view – The contacts view now displays all the detailed information you have about a contact. Their IM information, home and office addresses, and URL’s are all displayed. Offline support – In today’s world, it’s difficult to imagine being “off-the-grid”. But if you find yourself in such a situation, Zoho Mail lets you draft an email and save it. Hit send when you’re done. The mail will automatically be sent as soon as you are connected again. 3D touch – Glance at an email without actually opening it by pressing down on it to preview it. You can also use 3D touch from the app icon on the home screen to pop up some Quick Actions–compose an email, add an event or contact, and run a quick search through your messages. 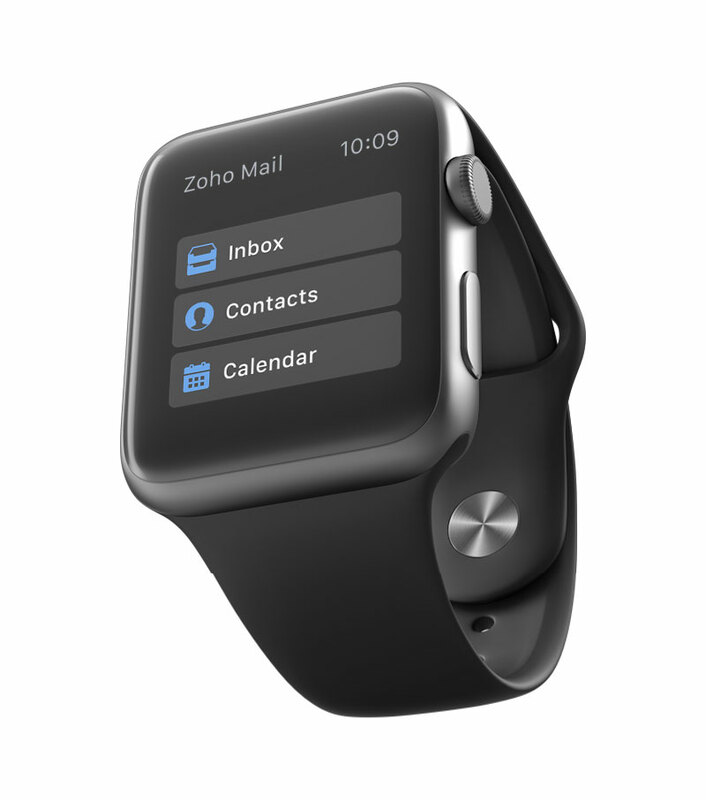 Watch – With Apple Watch support, Zoho Mail notifications come right to your wrist, so you never miss any important updates. When a new email arrives, you can quickly see the sender and the subject, and then click to read a snippet of the message. You can also view your Calendar to see upcoming events. Pencil – With the Apple Pencil, Zoho Mail gets more creative. Using the Scribble feature, send a personal hand-written message in your next email. Mark up image files to add more dimension and information to your work. Split view – Multitasking just got a boost with Split View on iPad & Landscape support for iPhone. Configurable swipe actions – Swipe left to Move, Delete or Archive? It’s your choice! Upgrade to the latest version here to get access to all of our new features! We look forward to hearing your feedback. P.S: Windows phone users, don’t worry, we haven’t forgotten about you. We are working on an app. Stay tuned. Badge app icon number? How long can it take to implement that? Love version 2. When will we see multiple email account support in the web interface? I wish you could change the notification sounds in the Mail app on android! So annoying! I cannot find a way to turn off notifications for my Zoho mail on my Moto G4. Why is there no settings option in the Zoho mail app v.2.0.5? I dumped Google and gmail about a month ago (actually closed the account) and have been looking for an alternative with similar functionality and features since. Now I have found and signed up to Zoho. All good except I cannot get the app for my android phone without a Google account to access app store!? It seems a bit peculiar to me that I would have to rely on your competitor to access your product. Or is there another way to get it? Yes it is possible Renee. Here’s how you can do it: Go to Settings in the app –> User Accounts –> Select the email account –> Disable notifications. When we sent a email thorough Imap server it records/shows multiple times in sent folder and its creating some confusion to our users. Please help !!! still no shared folder support in the mobile app? We are working on this Jason. We’ll roll this feature, and a host of others, out in the next few updates. Stay tuned. Well…. for me a disappointment that ZOHO still did not took the road for Windows 10 UWP app for my Surface tablet and above all my Lumia 950. I really hoped for a decent app! Hey ZOHO when is this on your list so also for me and those millions out there (Surface/Lumia/XBOX!) that what to enjoy ZOHO on there favourite platform W10! We are working on a windows app Joost, for mobile and desktop. It is getting ready as I type this. I don’t have a date as to when we will launch, but I will let you know as soon as we are ready. Thanks for your patience. Been using the new app for a while and it’s really good. One feature that I’d really like to have is the unread count badge. I would be great if I can glance into my phone screen and see how many emails unread. At the moment I have to have both default mail app and zoho fetching only for me to see if there are any emails. Thanks for the feedback Arvy! You will be happy to know, we are working on introducing an unread count badge. We are not sure yet of a date, but this will roll out soon in one of our updates. Please stay tuned. This is also one of the most HATED features of your customers!!!! Conversation View is one of the most useless and productivity-wrecking things ever invented. Just because Google says its good doesn’t make it good. It can be turned off in the iOS but not the Android app. Please add the Conversation View OFF function to the Android app! Hello. Sorry you didn’t find Conversation View to be useful. Can you please suggest some ways in which we could improve it? You can turn it off on the Android app as well. Please go to Settings -> User Accounts -> Select the mail account -> Disable Conversation view. Still doesn’t work properly. I have to use gmail as my mail client set up via Imap. Then, the cut off emails show in their entirety! But, don’t get any of the Zoho app features. Your support has not helped. It seems the only mobile option I have without any cost. The old app worked fine. Sorry about that Tom. Someone from our support team will get in touch with you ASAP to get this fixed. Thank you for the update. However, i am unable to attach documents to a mail from the mobile app (except photos). Also, the app is unable to launch any of my mobile pdf viewers when i attempt to view a pdf attachment from my inbox. Sorry about that Valentine. Can you please send us a mail at mail@zohomobile.com? We’ll get this fixed ASAP. I receive/send messages fine. The problem is the messages received are truncated. I only get the first half-sentence or so of the message in the preview. When I try and look at the entire message, there is no text body to the message. There is just a TO/From and display images link which does nothing. No other information will show except for the beginning routing information of the mail. Of course I will have to uninstall this, if this continues. Otherwise I can see the nice potential. Sorry about that Tom. Can you please send us an email at mail@zohomobile.com? We’ll look into this and get it fixed ASAP. Thanks for the detailed feedback. However, I’m still having the same usability issue in Android. 2. Tap the menu icon. 3. Hit “Flag” (which is, by the way, very close to “Spam”, so there’s a high chance of sending an important message to Spam). Only after these 4(!) steps you can flag the message. Now let’s compare to GMail. In the mail list there’s a star. You simply hit it – and that’s it, the email is flagged. 1 step vs 4 steps – a VERY big difference, given the number of emails we have to process nowadays. Really looking forward to having this flagging system significantly improved soon. It still doesn’t have an unread mail flag on the app on iOS. The ability to add multiple accounts was great, but other than the pop up, seeing there are unread messages would be great. This is in our roadmap, Lori. It will be available in future updates. Please stay tuned. I’ll keep you posted. Thanks! I love Zoho Mail. I use it both in my desktop and in my mobile devices. I use the Android app since previous releases. But It’s a pity I never had push notifications when new mails arrives. I use to open the app to verify if I have new ones. I got it in a tablet with Android 4.1.1 and a phone with Android 4.4. That’s the only thing I miss from this app. Hope it could be resolved soon…. Sorry about that Pablo. Please send us a mail at mail@zohomobile.com. We’ll look into this ASAP. I really appreciate if you develop a products for Windows phone. Thank you! Still waiting for Windows Mobile 10…. We are working on it. We’ll have a concrete update for you soon. #Finally… Multiple email account support. I can die now! Well, I just got the new app…sadly, first try, and it is not allowing me sending emails. I just receive them…. Sorry about that. Please write to us at mail@zohomobile.com. We’ll look into this ASAP. It does not seem possible to turn off notifications or change sound when new email is received? My smartphone is Android. How do I actually download the app, step by step, please? I’m a total novice. Thanks. To download the app, go to the Play Store and search for Zoho Mail. You can download it from there. Any chance of support for Android Wear? Android Wear is not in our immediate plans Jack, and we do not have a timeline either. I’ll let you know once we have something concrete to report. Thanks! 2, even I switched off the ‘smart group read mail’, why the emails are still grouped? Sorry about that Frank. Please write to mail@zohomobile.com. We’ll be in touch with you to help solve the issues. Does your new iOS app allow you to schedule emails like the web version can do? Not right now. However, this is in our future plans. Please stay tuned. Cool and all that, but when I access my calendar through the email app, none of my events show up. Sorry about that Mike. Please write to us at mail@zohomobile.com, so we can look into the problem. Looking forward to the Windowsphone app! I have Zoho mail and I have the app on my phone. Prior to the new update I was able to log off my account on my phone. Now after the new update, I can not see anywhere that lets me log off the application on my Android. Please advise. To log out from your account, click on Settings (the gear icon) –> the power button at the top right corner. please make a windows phone version! It’s under development Taras. Stay tuned! Not all calendar entries show in the new version. Can’t figure out the selectivity, but they appear on the old version; and they appear on the desktop. That’s weird. Sorry about that Ron. Please write to us at mail@zohomobile.com, so we can look into the problem. I can’t make a new file. Why just apple for the pen and additional features? Android is a larger platform world wide. Android is a major mobile platform, and we will definitely support all Android features as well. We’ll keep you posted once we have an update. The new color is not so good. It looks just like OutLook now. Much better with the former unique Orange color. Other than that, it seems OK although I was used to the old format and really liked it as it was. Never mind. I found the color palette in settings. I still would not have copied outlook with the default, but thank you for letting me change it back. I am pretty sure I will also get used to the other changes. Glad you found the color you were looking for! Hopefully, it doesn’t take you too long to get used to the changes, John. Let us know if we can help in any way. how do I import contacts from gmail to the new zoho mail? You can import contacts from Gmail on the web from contacts.zoho.com. Once you import them, they will sync on the mobile app as well. There is no Zoho Mail app on Samsung Galaxy Apps store. Finally!!!!! Multiple account. Thank you! The POP configuration was helpful at least. We are so happy to offer multiple account support! Please keep your feedback coming in, for further improvements to the app. Thanks! Good job guys, keep on developing. +1 for please getting the push notifications working correctly with 3rd party mail apps – currently still not working. Also a badge notification when a new mail comes in please? Thanks. push notifications for multiple accounts aren’t going through, just the original account. Sorry about that Dylan. Please send us a mail at mail@zohomobile.com. We’ll get this fixed ASAP. Thanks for the multiple account support… just what was needed on this app. Our pleasure, Eddie! We hope you like the app. Please keep your feedback coming in. What about steam about the mobile apps ? Do you have information ? Stay tuned :). We’ll have an update for you very soon. Why did you stop imap services? 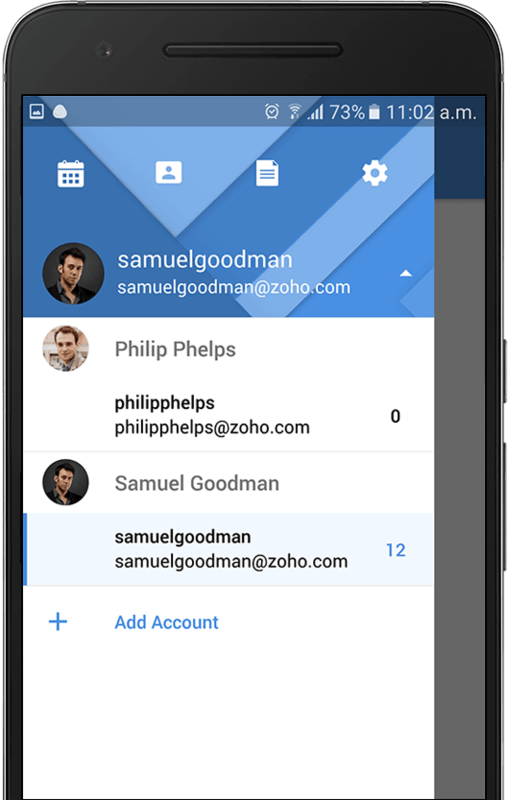 How to sync contacts from phone to ZOHO Mail app 2 in Android 6? Right now, we do not sync your phone contacts with the app Miha. However, we are working on this for future updates. We’ll keep you posted. Awesome!! Already downloaded on my iOS devices. Nice update but how to change the language at the Iphone? Multiple accounts finally. But no way to color code each account, so in the common inbox no way to see which email is from which account. Nice suggestion Daraius. We’ll try to work this into one of our future updates. Thanks! Sorry about that Trevor. If you are still facing this problem, please write to us at mail@zohomobile.com. We’ll be in touch with you right away to help. Can you please allow IOS users to change the default notification sounds for new emails. This is always very annoying as the default sound is too harsh and need a way to allow us to change it our liking. Changing all the sounds on the IOS settings does not seem to affect the sound on new emails. Thanks for the suggestion. We’ll include this in our to-do’s for future updates. How about fixing the current features in the app, such as Push Notifications for mail hosted not with Zoho (since you’re server reliability is not up to par, and I can’t lose email communication so I have to host it elsewhere). Or making it so my Zoho Mail inbox syncs automatically and more frequently instead of me having to refresh and wait 3 minutes just to get my emails. Yep, great update! 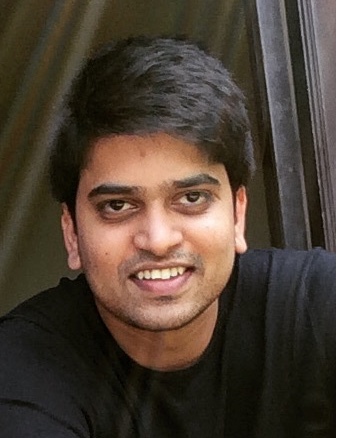 Thanks, Zoho! Would love an app for my surface!!! Stay tuned David 🙂 We are working on one. Hey Siri, let’s get more productive!